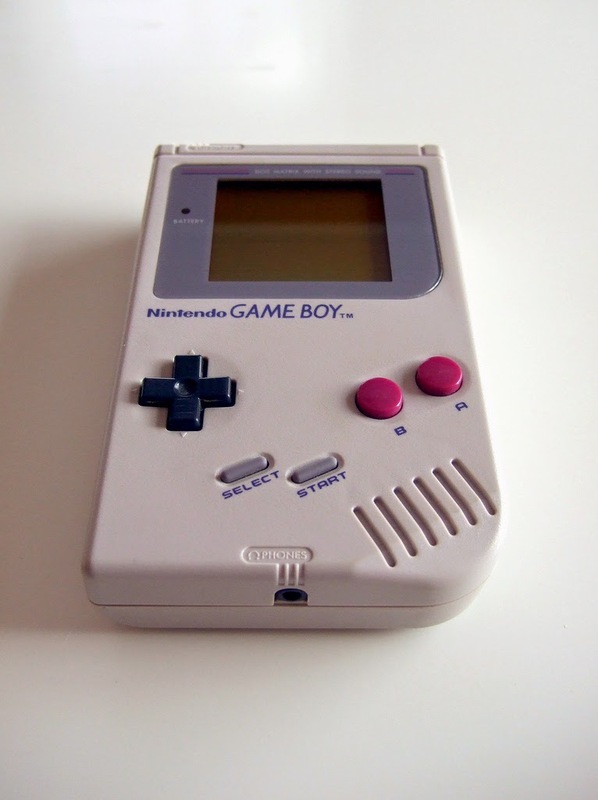 The Gay Gamer: Happy 25th anniversary, GameBoy! US Gamer has been publishing a lot of articles to celebrate this anniversary... I'd recommend you take a look if you haven't already. I can't say the system was a favorite of mine, but I do recall spending lots of time playing Solomon's Club, a GB extension of the NES puzzle game. All the stages were different and a whole lot easier, but that approachability was part of its charm. Definitely worth checking out if you can find it. It prompts me to wonder how we quite manage to game for so long lacking a back/front light. Having been glued to my ever-reliable GBA SP for the better side of 3 years, I've occasionally knocked the light off as something of a throwback experiment and, really, I struggled to decipher 75% of what was happening on screen. I came into the fold during the Pokemon/GBC-spurred revival of the late-90s and, no hyperbole, for the next few years it was the center of both my gaming and social life; the time spent involved in it goes ways to explaining why I can trace the maps of Kanto and Johto with my eyes closed, yet can scarcely recall a single lesson from primary school. Hmmm, I'll have to check out the US Gamer coverage. Thanks for letting me know about it. As for the GB being a favorite/not-favorite: I mean, I wouldn't honestly say it competes with, say, the DS or 3DS in my heart/mind, but I have a lot of love for it anyway. Some of the GB games I've mentioned here lately are really well made and thought out, IMO. Plus, most of them are perfect pick-up-and-play experiences, which is the kind of thing I'm leaning toward these days. I've long known about Solomon's Club, of course, but I've never played it. Of course, I barely touched Solomon's Key back in the day, although I have fond memories of watching a roommate play it in college. Oh, I hear you, Jyr! I honestly don't remember being annoyed by the lack of a back or front light, though, to tell you the truth. Maybe it was because portable game was still so novel then and so it was hard to complain about anything given you had a portable gaming system sitting in front of you? I really don't know. I do remember huddling under a bright light at night in order to play, though, so clearly there were some issues with it. Thanks for sharing your story/thoughts about Pokemon and how it played a role in pulling you into the gaming fold. I also enjoyed Pokemon Red/Blue back in the day, although I came into it quite late and probably was a bit too old at the time to become as obsessed with it as the kids who were and are the series' primary focus. I loved my old brick of a Game Boy, and I still have most of my library. I spent so much time playing Tetris, Final Fantasy Adventure, Teenage Mutant Ninja Turtles, etc. It's also the only game system my Dad would play with any regularity, and to this day the first thing he asks about any system I buy is "Does it have Tetris?" Hey Jyr, you got the original GBA SP or the new model with the improved backlight? I've got one of those NES models that looks really cool, but has a milky front lit screen that doesn't look so hot next to the Game Boy Micro. Then again, that one doesn't play old Game Boy or Game Boy Color games. I remember seeing Super Mario Land in the glass case at Toys R Us, not even knowing about the release of the Game Boy. It was crazy new and unexpected and i could only imagine how amazing the game behind that fantastic Mario artwork was. I didn't care what it was on, i just wanted to play that new Mario game! My brother and i combined our money to get one a couple years later, but i don't think we ever got the original Super Mario Land! I have a lot of good memories with GB: the first game system i ever purchased, the first game i ever purchased (Yoshi), those haunting tunes (and Chocobo!) from FFAdventure and all the Legends games, getting Yoshi's Cookie for making it through another school year, getting Zelda on a hot summer day and being upset i had to go to band practice that night, the same happened with Kirby 2, my brother and i bugging our dad to get us games that were on sale (including Solomon's Key!). I think i have more fond memories with the old GB than any other system. Speaking of Super Mario Land: I really have to go back to that one someday soon. I loved it when it was new, but I don't believe I've played it since, and I've heard it didn't age well at all. I also have to actually play Link's Awakening--as in, for the first time. I've never been a huge Zelda fan, and probably because of that I completely skipped over that game both back in the day and ever since. Nintendo has a habit of *making* you want a lot, because they release fifteen different models of the same hardware. I'm happy enough with plain black and white game systems, but Nintendo figured out pretty early that custom colors and "limited editions" are a good way to sell their products to collectors and more adventurous gamers. I've heard of people making "ultimate GBA SPs" by gutting one of the later models and putting its components in the shell of an NES GBA SP, but that just seems wasteful. I'd rather have one of the modded Game Boy Advance systems that Rose Colored Gaming was selling, but most of those are sold out and have been for some time. Shame, as that Tangerine Dream model looks gorgeous! I finally got Super Mario Land on 3DS VC and i still really like it! The physics are weird for a Mario game, but it's still a lot of fun to run through every now and then. The music was always great! It makes me wish Hip Tanaka still made game music. Yeah, SML's physics are kind of weird, if I remember correctly. Plus, things feel a bit off simply because everything's so much smaller than in other SMB games. Anyway, I'm glad you still enjoy it! I bought one of these wonderful little devices at launch, and just adored it. Everything about it just seemed so amazing at the time. My favorite memories are of playing through Legend of Zelda : Link's Awakening (which is still a tear jerker) and Mega Man (which was made harder by the bluriness of the action as I recall). So many feels and memories! Your memories are very similar to my own, Ken, although I--rather stupidly, I have to admit--have never played, let along finished, Link's Awakening. Don't worry, I'll rectify that soon enough. I remember the Gameboy launch like it was yesterday. I bought it on the official launch day in Europe on September 28th 1990 with Super Mario Land and was hooked from the very first second I switched it on. It was like science fiction for me to have a complete portable video game system with it's own b/w screen, 20-30h battery power, an included joypad and changeable game cartridges. Great times. Hey there, Bodo! I felt the same way upon getting my hands on a GB for the first time. "What is this, science fiction?!?" The very idea of such a thing was pretty mind-blowing back then, wasn't it?